The UFC 150 main event will feature the UFC lightweight title bout between the champion Ben Henderson and the former champion Frankie Edgar. Henderson defeated Edgar at UFC 144 earlier this year, and now Edgar will look to bring the title back to New Jersey. It should be an excellent fight so let’s go inside and break it down to see who the winner will be. 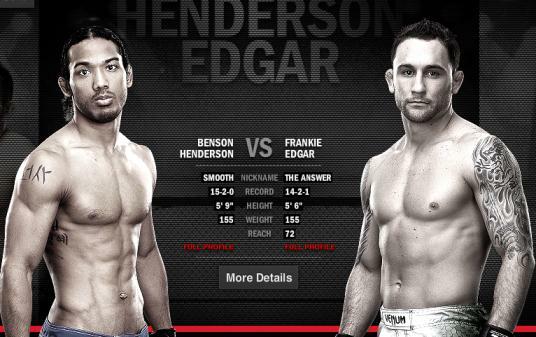 Frankie Edgar (14-2-1) is coming off the unanimous decision loss against Ben Henderson at UFC 144. Edgar had gone (6-0-1) since his first professional loss against Gray Maynard in 2008 and later avenged the loss with a KO win last year. Edgar features a lot of movement with good boxing and wrestling that he does a solid job of blending together. He has good cardio and seems to be developing some power at this stage of his career. The biggest problem with Edgar is that he takes a ton of damage in his fights and he’s usually the smallest fighter in the cage. Ben Henderson (16-2) is coming off the unanimous decision win against Frankie Edgar at UFC 144. Henderson has made a ‘Smooth’ transition into the UFC, winning all four of his fights since his last loss which occurred in the last WEC fight ever against Anthony Pettis. Henderson has eight wins via submission with two TKO/KO wins to his credit. Henderson does everything well with his strongest attributes being his cardio, scrambling ability, and his submission defense. Our sponsor Top Bet has Henderson as the betting favorite at (-200) and Edgar as the underdog at (+160). I agree that Henderson should be the favorite going into this fight since he clearly beat Edgar in their first matchup. Some people thought Edgar deserved to win but I thought that was absurd because the first fight wasn’t particularly close in my opinion. I think the rematch will be a lot like the first match, but both fighters will probably make some adjustments here and there. Edgar tried to use his wrestling a lot in the first matchup with him taking 12 takedown attempts(successful on five of them), but I think he’ll try to use more movement on the feet and transition into his takedowns off his striking. I think he’ll also try to commit more to his takedowns if he’s able to catch the kicks of Henderson the way he did in the first matchup. Make no mistake, those kicks landed first before Edgar was able to catch them so he needs avoid too much of that with this fight taking place in Colorado, as those body kicks could case serious cardio issues for Edgar. Edgar going to have to fight a very smart fight and make minimal mistakes if he’s going to win this fight. If he wins I expect it to be a very close decision, probably a split decision. I think we’ll see Henderson utilize his wrestling a bit more in this fight. He was able to do a good amount of damage with ground and pound when he had top position on Edgar in the first fight. Edgar will not be much of a threat to submit Henderson from the bottom, and again it negates the crisp boxing and footwork of Edgar by putting him on the mat. I like Henderson in the rematch here. I think he stops Edgar this go round via TKO, and sends Edgar to the featherweight division where he should be competing against guys more his size.